Language: English will be the language in the camp; basic conversational skills are needed. Accomodation: We will sleep in shared rooms in a sleeping bag accommodation. Please bring your own sleeping bag. Extra: Participation fee EUR 300 (Euros). Please note that the fee can either be transferred in advance via bank transfer, or paid for on arrival. 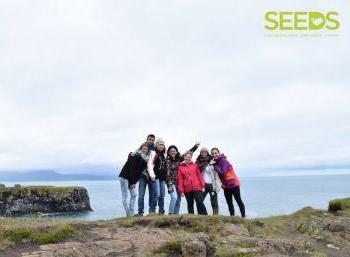 PROJECT: The Coast Cleaning & Environmentally Aware project is part of a series of camps organised by SEEDS in cooperation with different partners in the capital area of Iceland. SEEDS works with The blue army, an organisation dedicated to the cause of coast cleaning; with Whales of Iceland, an exhibition of life size models of whales and porpoises aiming at educating about the lives of these animals and human impact on their existence, and SORPA the organisation in charge of waste collection & management in the Reykjavik area. This camp allows participants to learn about global and local environmental issues, especially regarding ocean plastic pollution, as well as to contribute directly to environmental protection by cleaning the coastline. This project is based on similar projects around the world, where outstanding results have been made with volunteers. We aim to also host a public beach cleaning to get locals to join us. We hope participants will also learn how to plan their own coast cleaning projects and that they will create such events back home. Virtually every piece of plastic that was ever made still exists in some shape or form as plastic takes 500 to 1,000 years to degrade in nature. Plastic is approximately 90% of all the trash in the ocean and about 80% of that plastic comes from coastal dispersal by people. The best way to help fight this is to clean the coastlines, to avoid trash coming from the land entering the sea and to pick up trash from the sea that has washed up on shore. Participants will visit local projects focused on the environment, such as a Geothermal power plant and have a guided tour of the facilities via multimedia installations and presentations to learn about Iceland‘s geothermal energy utilization; and also a recycling centre where a tour of the plant is given and the activities are explained. This camp combines learning, sharing, cleaning some of the Reykjavík shores, and having fun. Participants should also use this opportunity to share something about environmental issues in their country with the group of international participants. Included is a trip to the Hot River Hike, which is a hike up Reykjadalur valley in the vicinity of Hveragerði. The valley is filled with hot springs and there is a hot river in which one can bathe. No previous experience is necessary, participants should be ready for spending time outside, walking along the coast for the cleanup, as well as for other activities and sightseeing. As part of the project is happening outdoors, volunteers shall be ready to adapt and be flexible with the working and free-time schedule, as depending on the changeable weather, we may not be able to perform some of the tasks or activities planned. ACCOMMODATION: SEEDS participants will stay in a house in Reykjavík. The facilities are basic with a shower, washing machine, kitchen and everyone is expected to show consideration for their companions. We will sleep in shared rooms in a sleeping bag accommodation. Please bring your own sleeping bag. We will receive food supplies and you will be in charge of the cooking and cleaning activities. Do not forget some traditional/typical food, drinks, recipes, music, games or movies from your country for the international evening. LOCATION: Reykjavik is a dynamic, modern city which lives in harmony with beautiful nature, using renewable energy sources - geothermal- and hydropower. The world’s northernmost capital bridges the Atlantic, between Europe and North America. Reykjavík is spread across a peninsula with a panoramic view of the mountains and the Atlantic Ocean on almost all sides. TERMINAL: Closest international Airport: Keflavík/Reykjavík (KEF). Bus station: Central Reykjavík (BSÍ). EXTRAS / SPECIAL REMARKS: Participation fee EUR 300 (Euros). Please note that the fee can either be transferred in advance via bank transfer, or paid for on arrival. The fee includes transportation from the meeting point to the camp and back into SEEDS office (on the first and last day), as well as the visits to the Geothermal power plant, the recycling centre & the Hot river Hike excursion. Meeting time will be 18:00 (6:00 pm) on June 10 at SEEDS Office in Reykjavik. Participants that cannot arrive on time (later or delayed flights) will be sent information on how to reach the camp on their own. Other excursions (eg. Golden Circle, South shore, Reykjanes and/or Snæfellsnes) can be arranged at discount fares in case there is additional free time after the workshops or sessions of the camp. Weather may be very cold and/or rainy, so we recommend to bring winter warm and/or waterproof clothes (overcoats, scarves, gloves and hats) as part of the project takes place outside. © Copyright 2005-2019, SEEDS - All rights reserved.